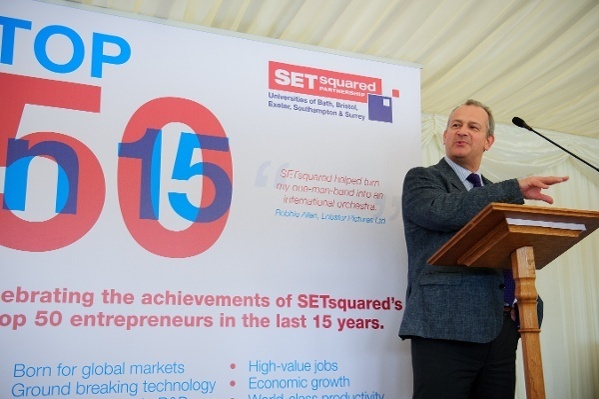 In March, I was honoured to be included on SETsquared’s list of Top 50 entrepreneurs in the last 15 years. The top 50 list got me thinking, what are the keys to entrepreneurial and business success? Clearly, there’s no one size fits all formula, here’s some of what I’ve learnt along the way. Collaborate. Put together balanced team and by identifying individual’s strengths and weaknesses you’ll have all bases covered. Ensure each member appreciates the importance of the “team” thereby nurturing a collaborative culture. Admire your team. I am consistently impressed by the quality of the individuals on the team. If you can’t sit back and think ‘Wow. They’re good!’ then there’s a problem. They might not all approach a problem the same way as you would, but they should always pleasantly surprise you. Listen. Take advice from as many people as you can on situations and decisions. There may be more than one right answer but at the end of the day you decide what’s best for your business. Investors. What level of investor involvement do you want? Some investors are heavy duty, some will have time limits on their money, some let you get on with it. How do you want them involved in your business? Endorsements. Whether it’s a great idea, service or technology, get third party endorsements or even better get them to part with their money. Customer money is preferable to investor’s. Competitive. Can you honestly say you maintain a sustainable competitive advantage? If it’s a great idea, how do you stay ahead? If you can patent – file, file, file. If not, run like hell and keep running. Ecosystem. A great ecosystem can provide plenty of support and advice including shared work spaces, incubators and accelerators. Failure. If you’ve experienced failure, you’ll know how to do things without money, or customer money, how to maximize grants, network and have no fear. You’ll know how it feels and will be determined not to repeat it. Give back. When times are good, take the time to give back to the ecosystem. Whether sitting on panels, giving advice, sharing contacts, an ecosystem isn’t something just to take from but something that needs feeding and nurturing.